there is no denying the fact that smoking can kill. on that score today´s subject - horn pipe - is examined from an art-historical perspective. smoking pipes made of staghorn have a fascinating history and we like to introduce with Lebrecht Wilhelm Schulz a very special artists. it is said that smoking a pipe can be described as art and it is also the oldest known traditional form of tobacco smoking. the building of a pipe knows several ways and our focus is on horn pipes. a famous carver of horn pipes at the beginning of the 19th century was Lebrecht Wilhelm Schulz (1774 - 1863). born in Meiningen, Thüringen he was educated as scrimshander and focused on carving staghorn and ivory. in 1798 he was awarded the titel of a court art woodturner of duke George I (Sachsen-Meiningen). later in 1832 Lebrecht Wilhelm Schulz was appointed to the Berlin Royal Academy and was awarded the silver prize medal. historically mentioned art works of Lebrecht Wilhelm Schulz are among other two horn pipes which he paid homage to the winners of Waterloo Wellington and von Blücher. artfour is proud to offer designs of horn pipes attributed to Lebrecht Wilhelm Schulz. 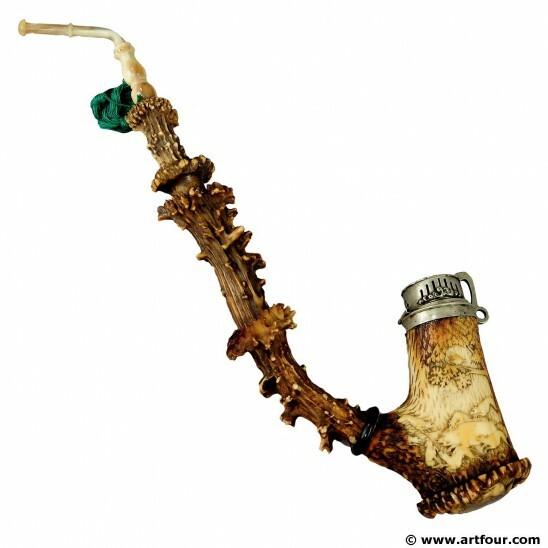 our picture gallery gives an insight into this quite unique world of pipes.